Image: a so called dolly tub, formed by the flowing water, and connected to the next dolly tub by a deep and narrow canal. Grottes des Planches, France. Image: a dolly tub with the typical shape: circular with vertical rims. The rock in the dolly tub was turned around by the water forming the tub and becoming roud itself. Spannagelhöhle, Austria. Dolly Tubs are erosive forms produced by flowing water. A river with high energy (steep downward slope) transports sand, gravel and rocks. This hard material erodes the walls and the floor of the river bed and produces rounded forms. Maelstroms in the water, locations were the water swirls around on the same place for a long time, the gravel and sand starts to drill a hole into the floor. This are the dollytubs. As variegated as the swirls is the form of the dolly tubs. It is typically round or oval, normally it has a steep rim. Very characteristic are deep boreholes, much deeper than their diameter. 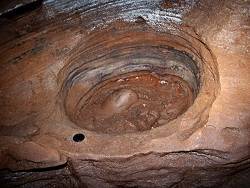 Depending on their formations this kind of holes is found everywhere where water flows. Gorges are a good place to look for them. Many are found at the mouth or the former location of glaciers, where centuries of flowing melting water formed the most extraordinary rockmillsor glacier mills. Famous samples of this kind can be found in Switzerland in the Canton Wallis, about a metre in diameter and 10 or 15m deep. 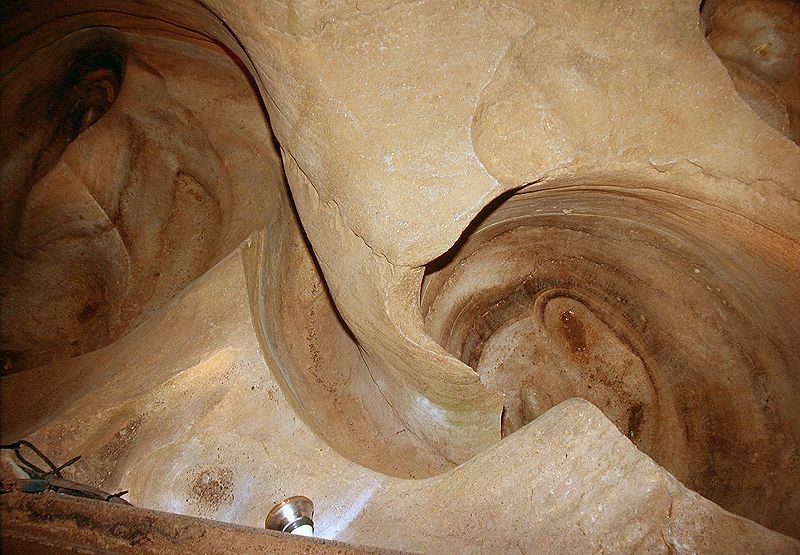 Dolly tubs are common in caves, as many caves or at least parts of cave systems were formed by flowing water. But they are not restricted to caves and they are not even typical karst features. Doly tuby and rockmills are found in all kinds of rocks and everywhere on earth.